If we were to award a food item with the title of “Fastest Way to Pack On The Pounds”, the winner would be refined sugar. You know the deal – sugar makes you gain weight (crazy fast.) We have been eating increasingly more sugar over the past 200 years, which has led to rising obesity numbers. Back in 1822, the average person ate only 6.3 lbs. of sugar per year, compared to 130 lbs. of sugar in 2012…You read that right – from 6 pounds to 130! That’s more than 20 times more sugar in our modern diet! No wonder Americans are fatter than ever. One of the reasons that the American diet is filled with so much sugar, is that some form of refined sugar is included in virtually every processed food. This is another reason that it’s important to cut those processed and packaged convenience foods out of your diet. But cutting sugar from your diet is easier said than done. Once it is a part of your daily diet, cravings are common, causing you to eat it sugar frequently. A diet rich in protein keeps you full, satisfied and less likely to crave sweets. A great way to make sure that you are getting enough is to plan each meal and snack around a protein. Plan breakfast around eggs, lunch and dinner around chicken, turkey, beans, or grass fed beef, and make snacks hard boiled eggs, string cheese, almonds, etc. One of the biggest fitness myths out there is the idea that calorie-free, artificially sweetened beverages don’t impact your fat loss results. The truth is that the diet drinks you’re sipping is making it harder for you to reach your goal weight. While the diet beverage itself doesn’t contain calories, it has been proven to cause cravings for sugary foods. Put down the diet crap and pick up a refreshing bottle of spring water. The sad truth is that some people in your life will try to sabotage your healthy diet. You’ll run into that pushy person at the office who insists that you eat a doughnut, the well-meaning family member who dishes you up a bowl of ice cream, and the friend who comes over with a plate of her home-baked cookies. The best avoidance strategy is to sincerely thank the sugar-pusher for their gift, and say you’ll enjoy it later when you’re hungry. Then get rid of it by donating to someone in true need of calories. For those moments when your sweet tooth is bugging you for something sweet, ditch the super-sugary candies and stick with a small square of very dark chocolate. Chocolate that is 70% or higher in cocoa content should be the only candy that you keep on hand. The benefit of the cocoa, in addition to the lowered sugar content, makes dark chocolate a justifiable occasional treat. What’s sweet, colorful and comes in hundreds of flavors? Organic, seasonal, fresh fruit, of course! As you remove refined sugar from your life, feel free to add in some natural sugar by way of fresh, local fruit. It’s amazing how satisfyingly sweet fruit is – it’s truly nature’s candy. My favorite are super healthy berries like strawberries and blueberries. As you begin to decrease your intake of refined sugars, you’ll find that your tolerance for sugar decreases. This means that something that didn’t taste sweet before – say a green apple – now has a huge amount of sweetness. 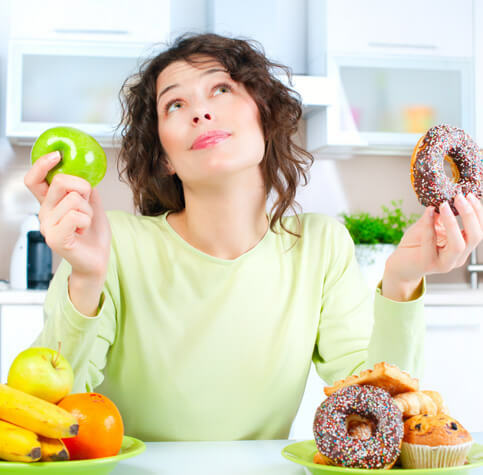 What’s happening is that your sweet receptors are becoming more finely tuned, now that you’re not overwhelming your palate with sickly-sweet refined and processed foods. Sign up with$1 enrollment today! Copyright © 2017 Carippedfitness.com All Rights Reserved.